15-years-old Naoto Matsukura has become the youngest ever IFMAR World Champion after a dominant performance at the 1:12 Onroad Worlds in Bangkok, Thailand. The Japanese driver came here with an already impressive CV with back to back titles in his National Championship but faced with the best in the world, including all four Touring Car World Champions, he rose impressively to the challenge. 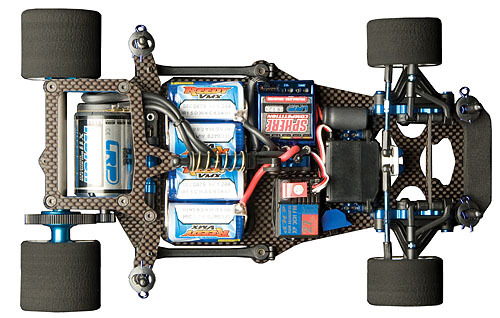 Hot property of Japanese manufacturer Team Yokomo, Matsukura was running Associated’s RC12R5. The designers in Area-51 built the 12R5 on a 2.5mm woven carbon fiber chassis that utilizes a pivotball link rear suspension that allows for independent adjustments for chassis roll, bump and alignment. Having the ability to make these chassis adjustments independently gives the 12R5 greater potential to get the best possible handling from the car and the track surface. The 12R5 feature new shocks that have a through-shaft design making for equalized damping throughout the full stroke of the shock in both directions, without any unwanted rebound. The center shock tower has four mounting positions that split the spring rates for even finer adjustments. The new center shock also controls the chassis droop and can be adjusted on the car with a turnbuckle wrench, making it easier and quicker to get dialed in. The 12R5's 'Active Strut' front end has been optimized, featuring symmetric components with adjustable caster and track width, as well as a new front axle with wheel nut. Factory Team blue aluminum servo mounts position the servo flat on the chassis for a lower center of gravity and include Ackerman adjustment spacers. The foam front bumper helps protect body and chassis during impacts.